April means goat milk season, and why not turn some of that delicious milk into crumbly, creamy goat cheese? Participants learned the world's easiest recipe for making chevre at this hands-on class with The San Francisco Milk Maid. 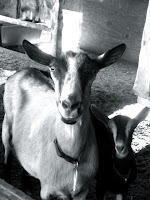 They found out how to season chevre with a variety of seasonings, and how to make delicious ripened cheeses with soft, fuzzy exteriors by adding mold spores to milk. All participants left class with a homemade cheese and ingredients and recipes to make more chevre at home.